Considering growing your own cannabis plants at home? Concerned about how it will affect your existing garden? With the recent Legalization of Recreational Cannabis in Canada, a new direction for growers to succeed, presents itself. 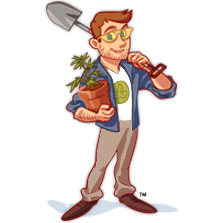 We are offering a set of Cannabis Gardener Services in Toronto, King City, Richmond Hill and the surrounding GTA that will have you exercising your green thumb. There are various steps to take when it comes to producing your own harvest and whether you are an experienced gardener or just starting out, knowing the laws and understanding how to create the most ideal growing conditions for your Cannabis plants is step one. According to the laws set in place, you must be 19 years of age or older to buy, use possess and grow Recreational Cannabis. For each residence, you are allowed to grow up to 4 plants per residence. *Please Note: Medical Cannabis is under a different set of rules and the production and selling of it is still exclusively regulated by the federal government. Something to be aware of when planning your Cannabis garden venture is all the stages the Cannabis plant will go through. If you are thinking about growing directly in your garden, the smell can become incredibly potent while the plant is nearing harvest time, and while you may enjoy the smell, your neighbours may not feel the same way. Luckily, we have some ways to help you combat that! A Greenhouse is an excellent option that can provide your Cannabis plants with an ideal environment to grow and flourish, in comparison to integrating it into your existing garden. However, there are a lot of key elements to carefully consider before starting on this kind of project. When it comes to planning the structure, it is important to know exactly what your grow space will need in terms of size, environmental controls and protection from the wind and weather. Keep in mind that in the colder months of the year, we may experience more extreme weather and dramatic temperature shifts, this can be damaging to the growth of your plants. With Canada’s unpredictable weather and temperature changes, it can take a toll on getting your plants to flourishing. Cannabis plants tend to thrive in warm and dry growing conditions, so we suggest that you aim to keep the temperature around 65 to 84° F. (18 to 29°C) in the greenhouse, a warm and balanced temperature will keep the plants happy. However, the temperature will always need to be monitored and adjusted throughout the growing process. Something to consider for your greenhouse: During the colder months, we advise implementing a Greenhouse Heating System, which will allow you to carefully control the temperature and raise the heat as needed. In contrast to that, in the warmer months, it is important to consider a Cooling and Ventilation system, as this will be critical in minimizing any heat build-up, that could result in unwanted humidity. Humidity can affect your Cannabis plants drastically. If it becomes too humid, the plant could develop mold or mildew, which can be dangerous if not spotted and if it is not warm enough, you could dry out your plants and hinder the growing process. And with any plant, knowing what helps the plant thrive will change the way you tend to your plants. For example: the Cannabis plant tends to thrive in a higher humidity level while in the vegetative stage, but when in the flowering stage, it prefers lower humidity. Concerned about the airflow? It’s important to build a sense of flexibility in your greenhouse design and consider ways to dehumidify the atmosphere. This will help your plants breathe and grow smoothly as the seasons transition. Types of ventilation breaks down into two main categories: Natural ventilation with roof and sidewall ventilations or forced air ventilations like exhaust fans or sometimes cooling pads. Ventilation allows hot air to be removed from inside the greenhouse, putting fans to help circulate airflow, which is good for keeping your plants healthy. During the colder months, daylight is much shorter and this can be slightly problematic depending what stage your plant is at. Growing in a greenhouse gives the advantage of natural sunlight, which is a cost-efficient solution, and gives the plant what it needs to grow. However, when your Cannabis plant reaches the vegetative state, it will require approximately 18 hours of light, and for that reason, we suggest putting in an additional light source to optimize year-round production. Understanding the stages of your plant can change the way your plant grows. During the Flowering Stage, the plant prefers longer periods of time in darkness, approximately 12 hours of uninterrupted darkness. Blackout curtains allows for the required amount of light deprivation for the plant, covering any spots that light can come in, even light traps for exhaust fans – your plants will thank you! If the greenhouse is not the route you wish to take and you would like to keep it as a seasonal project, we can also help you integrate your Cannabis plant into your existing garden or create a whole new bed! There are dozens of flowers and herbs that can help add nutrients to the soil and act as a natural pesticide to repel any unwanted visitors, as well as combat the smell around harvest time. Herbs such as Mint, Rosemary and Thyme are great for combating the smell as well as flowers such as Lavender, Jasmine and Lilac. Herbs like Cilantro, Dill and Peppermint help to deter pests. If you prefer flowers, Chrysanthemums, Marigolds and Sunflowers are a good start.